Over three years of living in Johannesburg, the township of Alexandra has changed in my perception. It's amazing how your preconceptions can alter what you think of as reality. What first looked scary became vibrant. What looked disorderly became lovable. What looked shady became interesting. And what looked malevolent became welcoming. And then I learned there was a theater. Someone once commented that it felt like I was their tour guide through Expat Life in South Africa. Well, today I definitely felt like an Off the Beaten Track kind of tour guide, taking my flock right into the heart of Alexandra, one of South Africa's most notorious neighborhoods, giving them a rare glimpse of this oft-maligned township including some humorous moments. I happened to drive past Diepsloot, still visions of the hundreds of beanie hats we had finished that morning for Mandela Day dancing through my head. It was the same shortcut I took the day I helped two women transport their firewood to their homes, which later became my first Strong Women of Africa story. Sure enough, I came across another group of women this time. When you live in Africa, you cannot help but note the women around you, every day, carrying what seem to be impossible loads on their heads. It never looks like it’s something made to be carried on your head. Not that I would know, mind you, which items are or aren't suited to be carried on your head. But still – a water bucket? A suitcase? Or a cage of chickens? Fellow blogger 2Summers’ recent post about Alexandra inspired me to add my own. I have no shortage of posts about Alexandra Baseball and my involvement with them, but Alexandra, the township, deserves a post in its own right. As 2Summers pointed out, Alexandra is steeped in history, perhaps even more so than Soweto, its much more famous cousin to the South. And if you want to get a glimpse of township life, I’d argue that Alexandra is a much better place to go than Soweto, which has become a tourist hotspot in the last few years and in a way lost some of its authenticity. Or maybe it’s just that inkling of “danger” that makes Alexandra so interesting to me. After all, I was warned to never drive there unless I wanted to be killed. But drive there I did, borne out of my wish to help and the simple fact that I’m the one with the car. If my baseball equipment is to be given to the people who need it, I have to bring it into Alexandra, it’s as simple as that. But I usually have either Tedius or Cedric, the baseball coaches who are so much more than coaches, as my trusted guides, without whom I’d get hopelessly lost. I’m always amazed how well they know their way around. It’s a kind of knowledge that is becoming lost in the age of GPS-guided cars, but very much still in demand in a place like Alexandra. My GPS would have been no help recently when they told me to turn into a side street and drive on the right side, into oncoming traffic it seemed. It was the only way to get to another side street for a stop at Cedric’s office. Miraculously, the oncoming traffic veered to my left and here we were driving on the right side of the road, just like home. If you move to South Africa as an expat, it is likely that you will live in the wealthy Northern suburbs of Johannesburg. 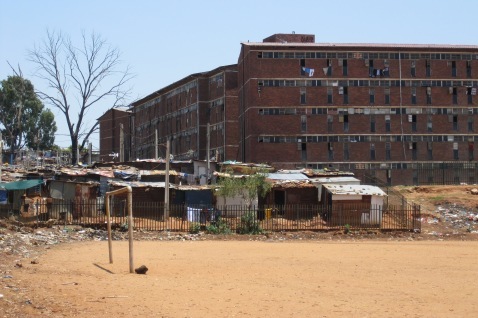 Adjacent to these privileged neighborhoods lies Diepsloot, one of Johannesburg's townships. You will likely become familiar with it by venturing there as a part of various outreach projects of your school. Here is the chronicle of one such day trip.